Aseb is the Egyptian version of the ancient Middle Eastern game called The Game of 20 Squares. 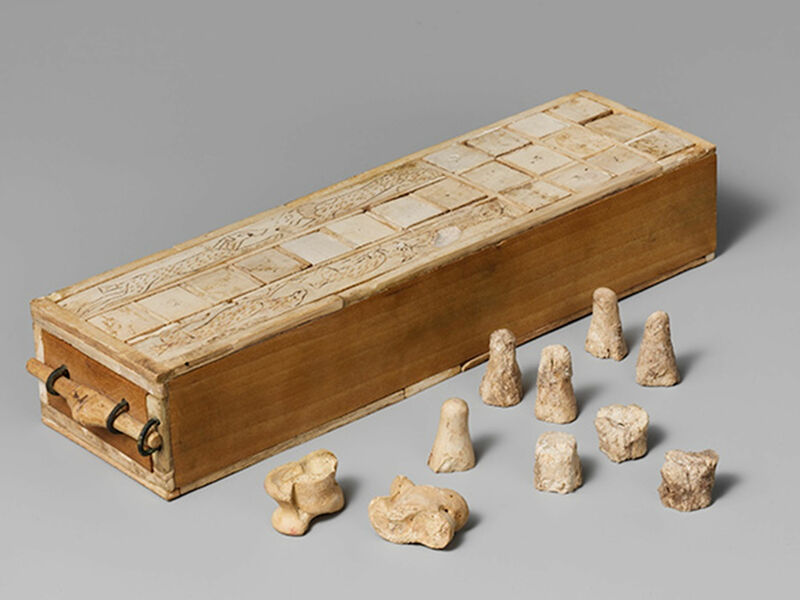 According to some historians the Egyptian name of this game was Tjau, which in the ancient Egyptian slang meant “got it” or “bingo”, but other claim that this name is a mistake. Aseb is related to the Royal Game of Ur in its more archaic forms, and probably arrived in Egypt from ancient Sumer, during the 17th Dynasty. Versions of Aseb have been found in Egypt, Sudan, Crete, and even in India. 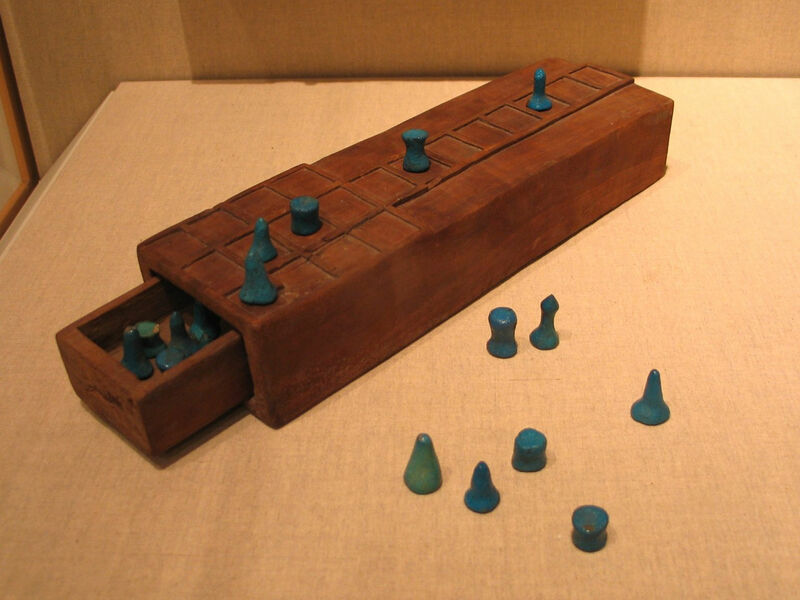 It is a race game, in the same category as Senet and the Royal Game of Ur, but is much shorter, quicker and simpler. The original rules of the game are unknown. I have presented here a hybrid set of rules, which are most interesting and challenging set of rules for Aseb, which I developed myself based on a different set of rules developed by a Russian game re-constructor Dmitriy Skiryuk (Дмитрий Скирюк) and originally published on his blog in Russian. I have included aspects from Skiryuk’s rules for Senet in my rules for Aseb. 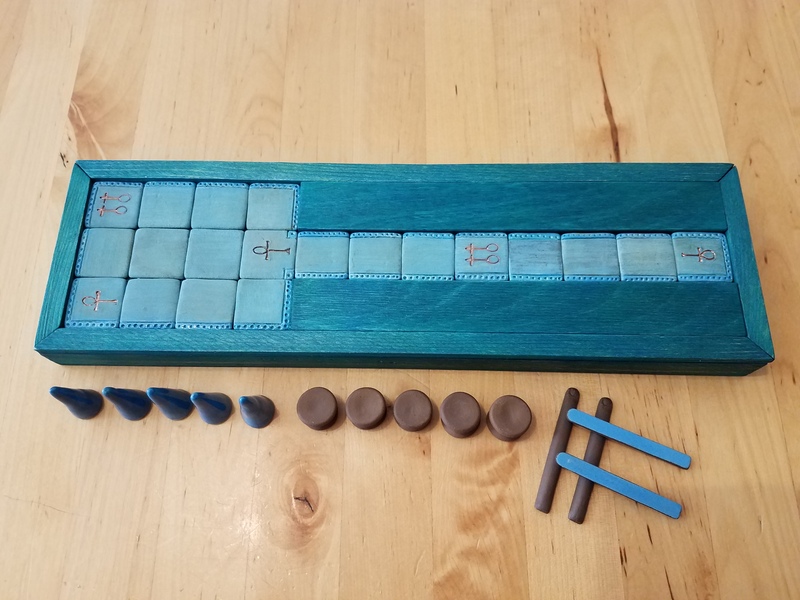 The game includes the board of 20 squares arranged into 3 rows of 4 columns and a line of 8 cells, 5 conoid pieces, 5 round spindle pieces, and 4, two sided, throwing sticks are included in the game to serve as dice, with one side rounded and the other side flat. In some versions of Aseb, a single 4 sided knucklebone, a single 4 sided stick, or a single 4 sided conoid dice is used instead of the throwing sticks. This slightly changes the game, because such a dice has an equal probability of any of the dice values, where as the throwing sticks do not. The game starts with all of the pieces located off the board, on the long fields adjacent to the line cells. If all four throwing sticks landed on the flat side the score is 4, which is the maximum obtainable score. If all four throwing sticks landed on the rounded side the score does not count and the player needs to throw the sticks again. To determine which player starts the game, both players throw the sticks. Whoever scores 1 first moves first. Each score of the dice determines how many cells the player moves from 1 to 4. A player can chose to move any of his pieces on any move, as long as the move is allowed. With each throw of the sticks the players can either add a piece to the board or move a piece which is already on the board. The players begin by moving pieces into cells #1-4 and #17-20, depending on what their initial dice score was. All cells can be occupied by only one piece at any time. Pieces are not allowed to pass their own pieces. So if a player’s piece is standing in the path of the next piece the following piece must stop on an empty cell preceding the blocking piece, even if the dice score would have placed it further down the path. If a player’s piece lands on a cell with the opponent’s piece in it then the opponent’s piece gets knocked off the board and goes back to the beginning of the game. All pieces can move only forward. If a player cannot make a move due to all available cells being occupied then they skip a turn. There are 5 cells that are marked: 4, 20, 13, 9, and 5. Those cells are called “houses”, and if a player lands on any of them they get a second turn. There are no safe cells in Aseb, from where a piece cannot be knocked off the board, except or the first four cells of the path on short rows (1, 2, 3, 4 and 17, 18, 19, 20) where the opponent’s pieces do not go. To move off the board the player must score on the dice the exact number needed to move off the board. For example, if the piece is located on cell #5, the player must score 1, if the piece is located on cell #6, the player must score 2, if the piece is located on cell #7, the player must score 3, and if the piece is located on cell #8, the player must score 4. If the player scores a different dice score and they cannot make any other moves or move off the board, then they skip a turn and wait for the next turn. Aseb is mostly a game of chance and does not have much strategy. However, if the players use 4 throwing sticks as their dice, instead of a single 4 sided knucklebone, a single 4 sided throwing stick, or a single 4 sided pyramidal dice, this creates some minor strategical options. The throwing sticks have uneven probability for different scores, as compared to a four sided pyramidal dice, which makes them more frustrating and exciting at the same time. Hey Buddy!, I found this information for you: "Aseb – Game of 20 Squares". Here is the website link: https://www.ancientgames.org/aseb-game-20-squares/. Thank you.